Die Co. nut retainers help securely install components within cabinets, racks and other enclosures. They’re a faster, easier option than tapping hundreds of rail holes and are used only where a component needs to be attached. For a strong, secure fit, just slide a nut retainer over the edge of the rail, locking them into the pre-punched holes. Place components in the cabinet/enclosure. Then, tighten screws or bolts into the nut retainers. Browse the selection of Die Co. nut retainers in our product catalog or check for a competitor part on our cross reference list. 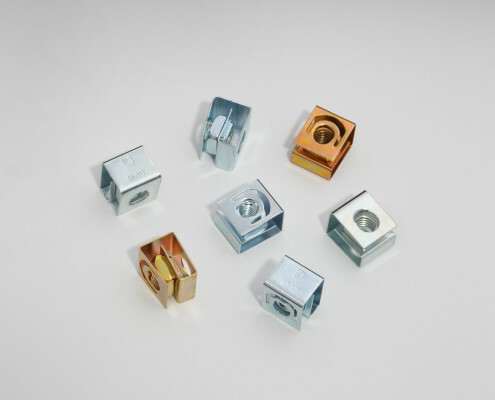 Die Co. provides cage nuts in more than 100 standard sizes – the largest cage nut line in the industry. Learn more about Die Co. nut retainers and find part numbers in our product catalog or check for a competitor part on our cross reference list. Email a Die Co. representative – or call 440-942-8856 – and tell us what you need. One of our fastener experts can help you find or design the best nut retainer for your application.